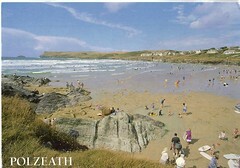 A postcard from my mate Simon who’s on holidays in England at the moment. He’s there in the middle of summer and it’s still too cold for him to go swimming, but he had a great time camping. From what he says, the ice cream and clotted cream is good too. Sounds like Simon might need to do a lot more jogging when he gets home again! Thanks for the postcard Simon. Looking forward to having a few beers with you when you get home!